Ok so I got new tires and rims and they rub... just wondering if I should cut the fenders myself or have it professionally done? where and how much rubbing? got pics? What’s your suspension set up? Stock? Small lift? It's not rocket science to cut them and really no need to have it "professionally" done. There are tons of right ups for doing it. Really will just depend on how good you want it to look after its done. 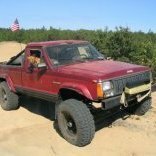 IMHO here's the best write up for keeping a stockish looking rig. Otherwise some tape to figure out the lines you want and a cutting wheel. Boom done. Fairly easy to complete. I did mine with a plasma cutter and followed up with a grinder. You've already clearance d them by the looks of it.